ATLANTA – For the third consecutive game, the Thunder lost a starter to minor injury midway through the contest. Once again it followed the lead of its floor general, rallied together and took care of business down the stretch. Center Steven Adams was out with a hip contusion from the get-go against the Atlanta Hawks, and after Paul George went down with a groin injury in the third quarter, the Thunder was missing two starters. That was no matter for the Thunder, as Russell Westbrook coordinated a group of Carmelo Anthony, Corey Brewer, Raymond Felton and Jerami Grant on a 16-0 run during a four-minute span to break a 103-103 tie with 5:15 to go to help generate a 119-107 Thunder victory. The explosion started with a Westbrook midrange jumper, and then on the ensuing possession Westbrook deflected an entry pass to his defensive assignment, then dove on the floor to pick up the loose ball. Down on the other end of the floor, Westbrook attacked and created a three-point shot for Grant, who buried it. After that initial forced turnover, the Thunder’s defense forced four missed shots and four turnovers over the ensuing four minutes of fourth quarter game action, all while producing high quality offense on the other end. Westbrook continually attacked and picked up six free throw attempts, making five of them. “I try to read and react and see what teams are doing defensively and obviously am finding ways to make the game easy for my teammates and figuring out what works for us,” Westbrook recalled. In the midst of Westbrook’s forays into the lane, he hesitated with patience just outside the paint, hitting a cutting Grant for an acrobatic and-one layup. Grant started the second half for the Thunder, played 33 minutes and scored a season-high 20 points on 8-for-14 shooting to go with 5 rebounds, 2 steals, 2 blocks and an assist. The capper to the Thunder barrage was an Anthony three-pointer, which gave the Thunder a 16-point lead with just 1:15 remaining. The jumper was one of 6 made three-pointers from Anthony in the game, and one of 16 for the Thunder as a unit. That’s the 7th time the Thunder has eclipsed 15 made threes in a game this season, one shy of its total for the previous nine years as a franchise. Anthony was sensational all night long as the Thunder’s catch-and-shoot maestro. He floated at the top of the key and at the slot, awaiting the attacking drives of Westbrook and fellow point guard Raymond Felton. In all, Anthony shot 7-for-15 on his way to 21 points, in addition to 4 rebounds and 4 blocked shots. 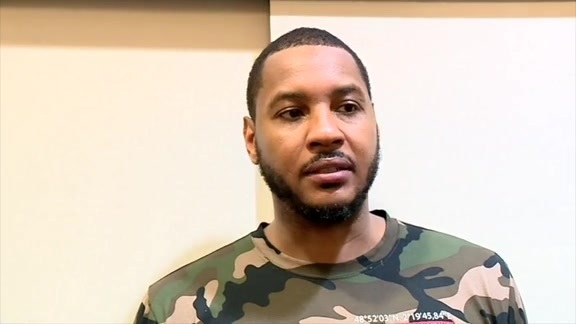 #HoodieMelo caught . 5 three-pointers by @carmeloanthony... and counting. It was quite the dramatic game for the Thunder as it swept a home-road back-to-back after landing in Atlanta at around 2 a.m. local time. George scored all 12 of his points in the first quarter, when the Thunder landed some of the first punches and took control. The second quarter was unkind to Oklahoma City, however, as it gave up 38 points, and 30 total points in the paint in the first half due to straight-line drives and a continual parade to the free throw line (18 first half attempts for the Hawks). After giving up 66 first half points, the Thunder’s defense buckled down in the third and fourth frames, giving up a total of just 41 points as Atlanta shot 35.7 percent, scored just 10 points in the paint and turned the ball over 11 times. 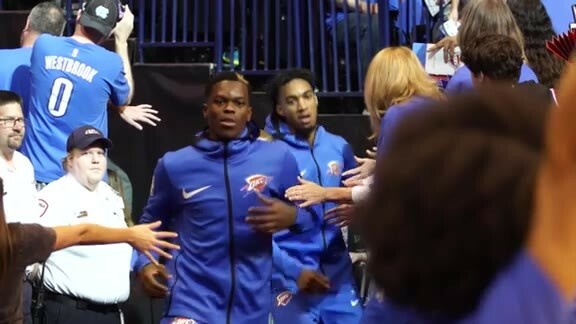 The tenacity and extra efforts that were missing in the first half were on point in the second, as rotations were hit on time and the Thunder’s size, length and quickness were all able to come into play. The win was rewarding for the Thunder in many ways. Westbrook compiled 32 points on 12-for-20 shooting, 12 rebounds and 12 assists en route to his 21st triple-double of the season and 100th of his career. That milestone is profound in the NBA record books, but is especially crucial to the Thunder, who is now 82-18 when Westbrook records a triple-double. With the win, the Thunder moved to 41-29 on the season, its highest mark above .500 all year.